Australia is one of the most alluring travel destinations on the planet. Drawing tourists from every corner of the globe, this vast land mass offers virtually every kind of holiday imaginable. The sheer size and scale of Oz may lead you to think that it’s tricky to get around, but if you’ve got the right information, you should find travelling Down Under a doddle. If you’re putting plans together for a voyage to Australia, here are some tips to help you get from A to B. Many people choose to drive in Australia, as car hire is widely available, rates are competitive, and you can travel between many of the main towns and cities without encountering traffic jams that take up precious hours of your holiday. The size of this country, and to some extent, its geography, make it virtually impossible to drive to every destination, but you can easily navigate your way up the famous East Coast or rent a car in Perth and explore the western coastline and local national parks. If you are planning to drive in Oz, pay attention to warning signs, look out for wildlife, and make sure you top up your gas if you’re heading off the beaten track. For those hoping to travel on a budget, and enjoy a flexible itinerary, hiring a campervan may be an ideal option. This is a hugely popular way to tour the country, and there are plenty of campsites available, most of which have great facilities and amenities. Australia covers almost 8 million square kilometres. If you’re eager to travel extensively and you don’t have months or years to explore, flying is an option worth considering. You can catch internal flights from major cities like Sydney, Brisbane, Cairns, Perth, and Melbourne and get to your destination in a fraction of the time it would take in the car or on a bus. Flights are relatively inexpensive, and they will enable you to see more if you don’t have the luxury of moving at a more languid pace. 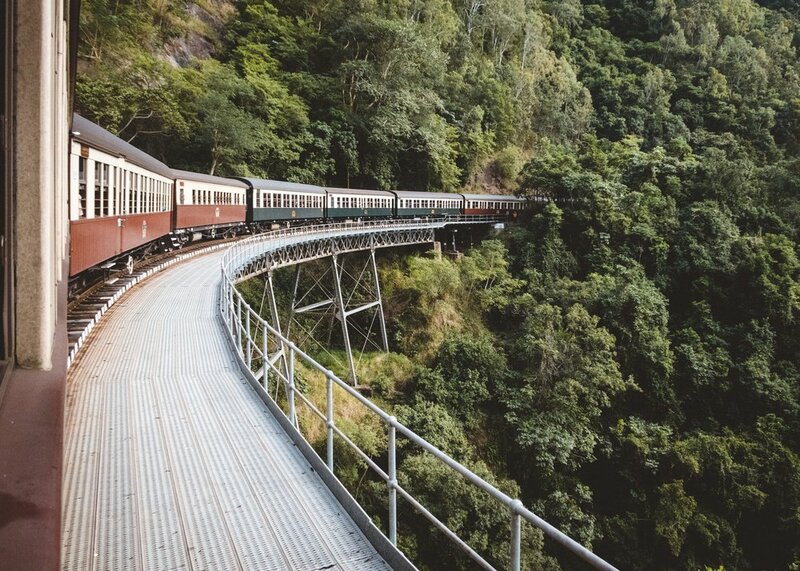 If you’re eager to enjoy the views on your tour of Australia, there are some pretty epic train journeys on offer in Oz. Train travel is often faster than driving, and you can kick back, relax, and just take in the scenery that surrounds you. Popular routes include Brisbane to Rockhampton, Sydney to Perth, Brisbane to Melbourne and the iconic track covered by The Ghan, which runs from Adelaide to Darwin. Buses and coaches are widely available in Australia, and this is generally considered to be one of the cheapest ways to get around. Long-distance coaches are a popular choice for travellers hoping to save on transport costs, and they’re also an excellent option for those looking to meet new people along the way. Are you gearing up for a trip Down Under? If so, you’re probably hoping to travel around, and see some of the iconic attractions and incredible landscapes on offer in this beautiful, vibrant country. There’s a plethora of transport options available, from hiring a car and taking a road trip to flying. Have a look around at offers and deals, plan a rough itinerary, and work out how much time you have to get from one place to the next. Header image by Jay Wennington.